Some people aren’t aware that AZ mobile home parks offer 55+ residents the best in domestic luxury, construction, and convenience. The specific features of Arizona mobile home parks deliver priceless lifestyle benefits our residents enjoy every day at Palm Gardens. When you travel to a tropical paradise for vacation, it’s not the sand, lobster dinners, or the bright sunny sky that makes the time you spend worthwhile. The entire lived experience, setting, mood, and context set the stage for a good vacation story. As with Cabo, so it is with the mobile home-based life – happiness and flexibility make all the difference. Variety –We can customize your mobile home purchase to fit your desired specifications by offering a wide range of floor plans to choose from. Our selection offers a number of floor plans and models with various styles of bedrooms, bathrooms, living rooms, and more. Freedom & Flexibility – Having a variety of options means giving our residents more autonomy over their lives and living arrangements. Instead of you adjusting to life at Palm Gardens, we want to adjust to you. Whatever your preference, whether for the luxurious or the quaint, Palm Gardens’ mobile homes are made to match you. High Value, Low Cost – Because properties in our Arizona mobile home parks are built in controlled environments using efficient, streamlined manufacturing processes, mobile home ownership comes at a much lower premium than site-built home expenditures. Abundance & Stability –Mobile homes are, on average, a 20%-35% better value than conventional site-built homes, saving you money for rainy days, investments, and the “extras” that make life sweet. A mobile home is an investment in your family’s financial future. Exclusive Community – Palm Gardens’ mobile home parks form a close-knit community fabric that serves to keep our residents safe and secure. Palm Gardens is is similar to a gated community because it is surrounded by walls that embrace the estate and ensure tranquility. Security & Peace of Mind – Palm Gardens’ strong community environment and protective architectural design give residents the kind of comfort and tranquility that’s hard to find in many mobile parks, but we know there’s no substitute for feeling at home. 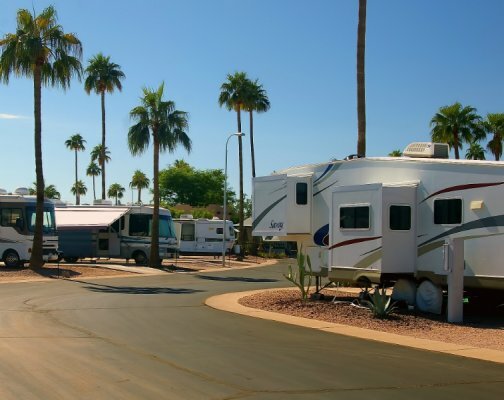 At Palm Gardens, we pride ourselves on the quality of life we provide the residents of our sunny, paradisiac AZ mobile home parks. We demand top-quality craftsmanship from our manufacturers, establish fair leases with our residents, and maintain our entertaining recreational facilities for our active community members, precisely because it’s our mission to guarantee top-of-the-line living arrangements, 24/7, 365 days of the year. That’s why we, at Palm Gardens, are able to invite you to live where others vacation!